Keyword everywhere, free keyword tool which provides plenty of opportunities to plan your content Keyword density. Mostly we have seen that most of the user are not too serious about this free keyword tool and run to a paid keyword research tool. And more of the entrepreneur and professional blogger find this keyword research tool helpful to find a rich keyword to master their content keyword density and improve their fast indexability on a search engine first-page result. Actually, free keyword research tool has a great impact on digital marketing, cause it provides a quality keyword key phrases as like a suggestion keyphrases to empower your content keyword density. If you are a beginner and moved into this Digital Marketing world, No matter which purposes you select like – for business product or services and looking to get a most valuable free Keyword research tool. Then this tool will be the best option to use and try to find relevant keyphrases. But to use this free keyphrases research SEO tool you have to understand the basic and insight features. It will help you to find the rich keyphrases and the hidden features of this free keyword research tool. There are plenty of users don’t get successfully access or you can say use this free keyword research tool and run or you can say Move on to a paid keyword research tool. But most of the success full blogger are well known about the hidden features of this Keyword research tool. And which you will learn and understand in this Article, that why most of the professional blogger still use this tool, to empower their content search visibility on search engine. What is Keyword everywhere and How to use this SEO tool? Actually, this is a free keyword research tool, which provides plenty of keyphrases finding an opportunity to find a rich keyphrase and suggested keyphrases ideas in his simple interface dashboard. To use this free keyphrases research SEO tool dashboard you don’t need to be a techie guy or you can say a technical minded, it just about a present mind game. This is a free Chrome extension and Firefox extension tool, which provide a free service to his user to find relevant and rich keyphrases to empower their content strategy through keyphrases density. You have to download this free tool on your chrome or firefox browser and your work is done. But to operate “keyword everywhere” features you need an API key, which you will get while you sign up with your Gmail account. And once you provide a Gmail to “keyword everywhere” official dashboards it will send you an API key to your mailbox which you have to provide to get API key. You have to simply copy your API key and click on the “keyword everywhere” “icon”, which will be seen to the right side of the upper corner of your browser. as you click on the icon you will see an update feature option, click on it and paste your API key in the validate box and click the validate button. Now you have full access with this free key phrases research SEO tool and ready to master your content keyphrases density and to find relevant key phrases related to your product or services. How to use and set up keyword everywhere SEO tool features? As I mentioned before to use this key phrases research Seo tool you don’t need to be a technical or professional, all features are very simple to set up. You have to simply go to your browser dashboard and click on the “keyword everywhere” icon and once again inter to the update option, or setting option click on it. As you click you will see plenty of default features you can change setting according to your interest or you can leave as a default. 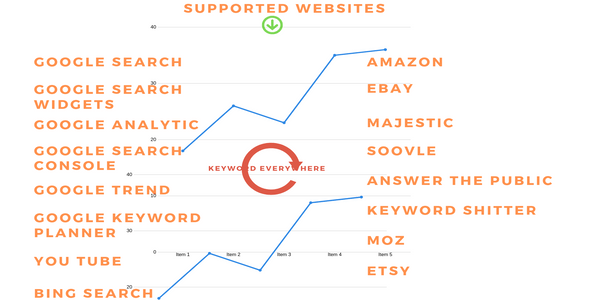 Here are step by step guide to set up keyword everywhere tool. 1-step – choose your specific country which you want to target or leave it to default as a global. 2-Step- choose a currency which will help to understand your keyphrases cps value in your own selected currency. CPC- High light CPC box with the tick, and set up a matrix for CPC, which you want for any keyword. Competition- high light the competition box with a right tick, and set up Matrix for targeted competition for the particular keyword. 4-Step- Check the supported website which you want to spy the key phrases from the specific platform, you can leave as default or you can target your website. Where you want to keyphrases research tool to perform to find or show the full details of specific keyphrases like-CPC, volume, and competition on their platform or dashboard. but to get full benefit to each and every website platform, which are provided by this free research tool to his user then you have to leave it default. How it makes easy to understand the value of this free research SEO tool to find keyphrases matrix in the specified website. It provides a miscellaneous platform to his user to get their work done easily, you can set it default or you can choose your own. but to get the benefit of this research SEO tool, Leave it as a default, cause it helps you to all default features in one place no need to get back to “keyword everywhere” miscellaneous setting to click on or off or to get that features to enable or disable. How to spy your competitor keyword density with Keyword everywhere Seo tool hidden features? We know that or some of we don’t Know that the Search engine is not a human been nature it,s an Algorithm which has the accessibility of machine learning and just only runs through some fact. 2-key phrases power in content or you can say keyword density. Actually, there are two types of keyword density on your content which spy by the search engine crawler. 2-LSI keyphrases density or you can say keyphrases that we see at the end of the particular page on the bottom. 3-Seed keyphrases density which has great placement in your content. These are some fact which gets to learn from other sources that how search engine Algorithm spy with a crawler in your particular content and insight website. Let’s begin to know about the hidden features of keyword tool to spy your competitor on page SEO Keyword density. Free Keyword research Seo tool or you can say a keyphrases research tool provides a platform, which is a hidden insight of the features. To use this features you have to simply put your competitor URL on search browser and open it on your browser dashboard but you have to remember that “Keyword everywhere” is only Available for Chrome browser and Firefox. As you open your competitor page you have to right-click on your Mouse, you will see a “Keyword everywhere” icon to analyze page to check keyword density. You will see a new interface dashboard, and at the upper side, you will see the address URL and title tag of that particular website page. On this free research tool dashboard, you can master your content strategy through targeting your competitor full on page insight detail. How to use Keyword everywhere to mastering your competitor on page strategy? Once you open your competitor insight keyphrases density you will see plenty of keyphrases details view, which has been placed on your competitor particular web page insight on page. With using this hidden feature you will get two benefits which are very important for SEO base to get your blog content search visibility on a search engine first-page result. 1- You will see plenty of suggested keyphrases idea for that particular Niche with a matrix of search volume and competition. 2- You can spy on your competitor strategy of keyphrases placement idea on H1 to H6 heading tag on that particular content. How to spy on competitor keyword density? 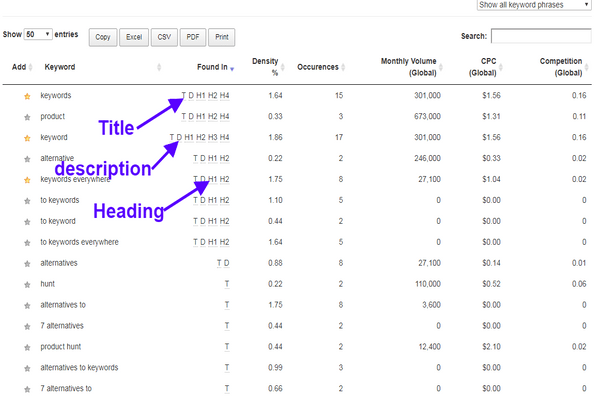 When open your competitor page to analyze keyword Density you will see a row box where plenty of key phrases and at the front of that Keyphrases you see a “found in” option, which shows that in what area that particular keyphrases has been placed. T= Title, D= Description, and H1 to H6 heading. And at the front of “Found in” you will see a “Density” option which shows that, how many several time that keyphrases have been placed in that particular content. Here strong density means that you have to target those key phrases which have high volume in the search result. Actually, when you see in your search console performance report you will see plenty of keyphrases which has a great impact on search result And that keyphrases are key phrases density. So that why you have to always look after or spy to your keyphrases, which has high search volume and low competitor. Actually, you don’t have to move for another keyphrases research tool to find or check out search volume and competitor. At the front of occurrences option, you will see the global search volume, global CPC and global competition for that particular keyphrases. Its depend on you that How you can manage to improve your keyphrases density and empower your content visibility on the search result. 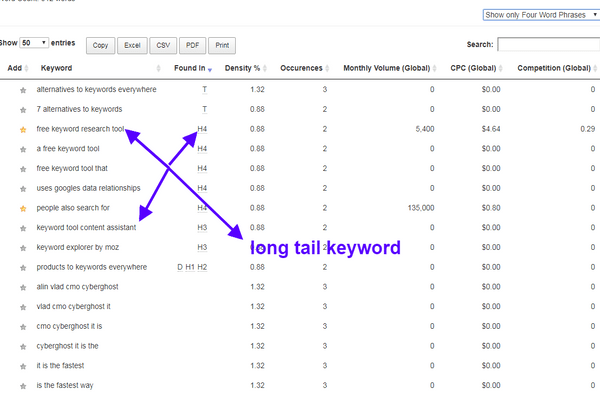 How to spy long tail keyword density on keyword everywhere? We all know that how long tail; is growing his impact to rank any content on a search engine first-page result. And to find the long tail keyphrases you have to do a lot of research. But you know that with using this free keyphrases research tool hidden features “Analyze this page” you can point the long tail keyphrases. Actually, while you analyze your competitor page keyphrases density at the right side upper corner you will see a keyphrases option box. And at that box, you will get 6 option to get or find out your relevant key phrases. You can select one of those options, it will show the full selected key phrases, which has been placed on that particular competitor content page. Mostly 3 to 4 word long tail keyphrases are more beneficial to get going your blog content on a search engine first-page result. How to spy long tail keyword using free keyword research tool keyword everywhere? As I mentioned before in the Article, if you want to find long tail keyphrases then this free keyword research tool is the best SEO tool. But to use this free keyphrases research tool, you have to do some simple research through targeting your competitor strategy. 1- First of all you have to find out top 10 competitors for that particular key phrases and open all site in your browser dashboard. .3- With doing this, you will find plenty of opportunities to select long tail Keyphrases with their CPC, volume, and competition. That’s done Know you have plenty of key phrases to master your content strategy with the right placement of Keyphrases density in Title, Description, and insight in your content. 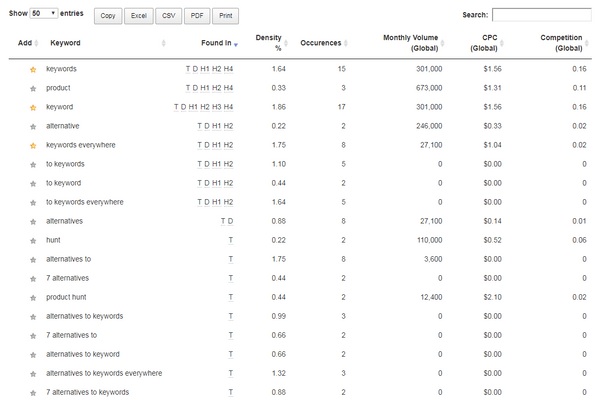 People Also Search for a free keyword research tool for a long tail keyword. Actually, you will find plenty of free Keyword research tool to find relevant long tail keyphrases but you will love this free keyphrases research tool instead of other free long tail keyphrases research tool. But the problem most of the user are aware of this tool features just only use to see the suggested keyword on search browser. And don’t use the hidden features of this beneficial tool. if you are a beginner and don’t have enough money to spend on any paid tool, you can use this tool to master your content strategy by targeting long tail keyphrases. But if you are using paid tool then also it is beneficial to find out long tail key phrases and check it out in your paid keyphrases research tool. And find out that is “keyword everywhere” is pleasant and beneficial for you to find relevant keyphrases. How long Does new website take to rank on the Search engine? What is content in marketing and its impact on Digital marketing? Top best 12 SEO checking websites. 15 best content management system. 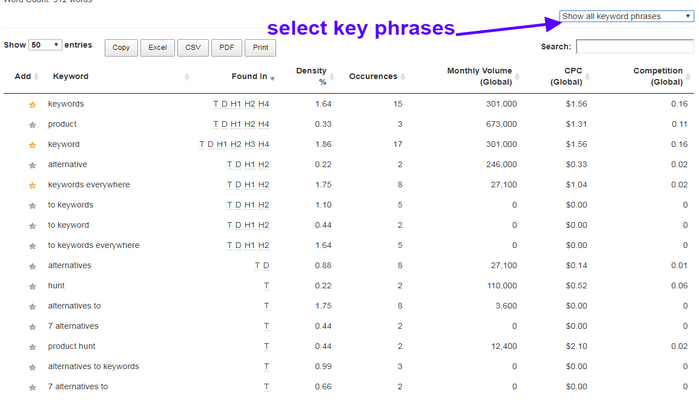 And how you can find a long tail keyword using hidden features of “Keyword everywhere” Keyphrases research tool. 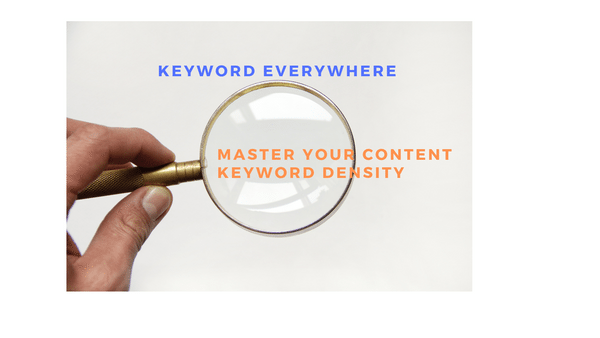 All the information in this Article is my own self which I mentioned as an Author and why I find this free keyphrases research tool to find the best relevant key phrases to improve my content keyphrase density. If this Article will help you can share with other user and sign up to our newsletter to get relevant and genuine information into your Mailbox. For any query or suggestion feel free to comment on the comment section, it will help us to improve more quality content to our user. Neil patel Ubersuggest 3.0: Newly updated features, benefits to building Awesome strategies. helpful tips really. Thank you very much. I will use them the soonest. Another learning! I definitely need to work on my keyword research. Thanks for this post! In one sleek extension you will get tons of information that will help you gather relevant keywords, their number of search queries, cpc and it’s competition. And most importantly it is free to use. Wow…..very insightful of you, Deepak. I will surely go back one step at a time when implementing them. I love this tool! Thank you for expanding my knowledge on different ways to use it! Some excellent info in this article. free seo report tool Great morning cool website! Guy. Excellent. Great. Let me book mark your web site and also go ahead and take bottles also? I’m just contented to discover a lot of information right here inside the post, we wish figure out extra methods this particular regard, appreciate your giving. This is such a useful topic for us bloggers. Content may be King, but if you aren’t using the right keywords and optimizing SEO, no one is going to see your content. I love learning about this! Such good tips here to help our SEO for our business, thank you!